Quest Vitamin E 800i.u. is made with natural source of vitamin E providing a balanced ratio of alpha, beta, delta and gamma tocopherols. Vitamin E is a protective antioxidant that contributes to the protection of body cells from oxidative stress. Are glycerol free and have been produced using less intensive manufacturing process to protect the high quality of the vitamin E ingredient. Provides the amount as indicated on the label; any space remaining in the capsule is a result of the filling process. D-alpha Tocopheryl, Capsule Shell (Gelatin, Glycerin), Sunflower Seed Oil, Mixed Tocopherols from Soya. As a food supplement take 2 capsules daily with a meal. Swallow with water. Do not exceed the stated intake unless instructed by a qualified health are professional. Below are reviews of Vitamin E 800 i.u. - Mixed Tocopherols - 60 Capsules by bodykind customers. If you have tried this product we'd love to hear what you think so please leave a review. 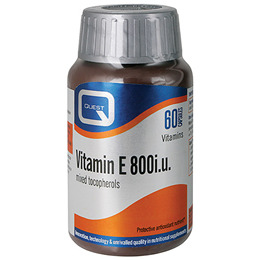 Quest Vitamin E 800i.u. is made with natural source of vitamin E providing a balanced ratio of alpha, beta, delta and gamma tocopherols. *Vitamin E is an antioxidant that contributes to the protection of body cells from oxidative stress.